Dave Alveberg caught the 13.73-pound record-breaking fish August 17, in roughly 4 feet of water off South Marsh Island near Tangier Sound. 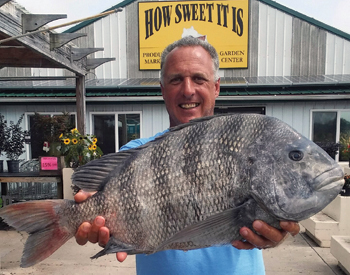 Intent on catching white perch and rockfish, Alveberg was using soft crab as bait when he says his line went “haywire.” After a brief struggle he pulled aboard the record sheepshead. “Seeing something like this on my boat was amazing,” Alveberg told Maryland DNR. He plans on getting his sheepshead mounted for display. DNR keeps state records in four divisions—Atlantic, Chesapeake, Nontidal and Invasive—and awards plaques to anglers who achieve record catches. Fish caught from privately-owned, fee-fishing waters are ineligible. Anglers who think they have a potential record catch should download and fill out the state record application and call 443-569-1381 or 410-260-8325. DNR suggests the fish be immersed in ice water to preserve its weight until it can be checked, confirmed and certified.